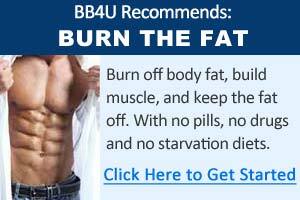 Gain Muscle Lose Fat - Total Body Transformation. How to Build Muscle Burn Fat. Aside from "how do I get rid of belly fat and get six pack abs", the other most often asked question would have to be "Can I gain muscle and lose fat at the same time?" Or as one of my personal favorite questions: "can I turn fat into muscle?". Talk to different people, and you'll likely get different answers - many will tell you that you can't really build muscle and burn fat at the same time, and no you can't turn fat into muscle. However, on the question of whether it's possible to build muscle and burn fat, there are some exceptional anecdotal evidence provided by natural bodybuilder and fat loss expert Tom Venuto that this is indeed possible. 1) Training age - it is always easier for a beginner to make gains compared to someone who's been training for many years. The further away you are from your genetic potential, the easier it is for your to make gains. 2) Muscle memory - it's always easier to gain back muscle you've lost than it is to build new muscles. 3) Genetics and body type - your genetics and your body type ultimately determines how easily it is for your to build muscle and lose fat. It’s entirely possible that you might pass through periods of “within-day” surplus where you were in a highly anabolic state (for example, you eat the biggest, highest carb meal of the day after your workout), and you were in a deficit the rest of the day. Exercises, specifically high intensity weight training sessions dramatically changes this dynamic. Certain types of training will alter your hormones and physiological response to how you handle calories and nutrients. If you did intense weight training, and you timed your nutrient intake just right, isn’t it possible that you could gain a small amount of muscle during those anabolic hours, while losing fat the rest of the day? Granted it might only be grams or ounces – but what if you kept that up for a week? A month? Three months? Ah-ha! This is a very revealing explanation, and certainly makes a lot of sense. Immediately following intense workouts, you have a very anabolic window of opportunity to feed your muscles, and this must be taken advantage of. Throughout the week, there are days where you have a caloric surplus, and days where you have a deficit for the entire day. Tom calls these within week and within day phases microcycles and mesocycles. This is known as nutritional periodization, or cyclical dieting. The key to this is the manipulation of your calorie intake by controlling your carbohydrate intake, also known as carb cycling and carb targeting - leading to periods of calorie surplus when you need it most to build muscle, and alternating with periods of calorie deficit to create an environment conducive to fat loss. So, if you were able to control your within-day energy balance, use nutritional periodization, and control your hormones with food and lifestyle strategies, then muscle gain and fat loss is possible. While this is a difficult goal to achieve, it is not impossible, and Tom has proven it with real people in his total body transformation contests, where it's not uncommon to see contestants lose fat and gain muscle at the same time. Tom has put all of this into his book titled "Holy Grail Body Transformation". In his program, he shows you all the details about nutritional periodization, cyclical dieting, hormonal manipulation, within day energy balance, nutrient partitioning, and all the keys to building muscle and losing fat at the same time.